Our Managing Director, Jon Bodington, had the last word in February’s issue of Professional Housebuilder and Property Developer. Click here to read the full article. 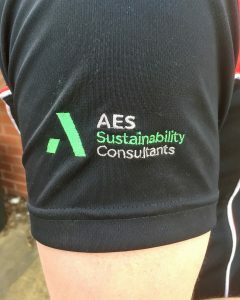 AES are proud to be sponsors for local rugby team, Cullompton RFC. Alex Brooks, our National Key Account Manager, is pictured here (wearing the hat) in the new kit with (from left to right) Harry Williams – Premiership & England Rugby player/Cullompton Coach, Sean Mardell – Tolchards, Ross Tomms – RJ Plumbing & Heating, Will Chudley – Premiership Rugby Player/Cullompton Coach and Steve Luxon – Cullompton Director of Rugby.